The above photo (click to enlarge) shows CNS, together with representatives from NE and NW CRT, receiving a special award at Birmingham Town Hall, for the response to the Floods at Christmas 2015 on the Calder and Hebble. CNS were involved in ferrying CRT staff through the stricken areas on their trip boat 'Savile', and surveying the damage to the canal from Wakefield through to Sowerby Bridge. 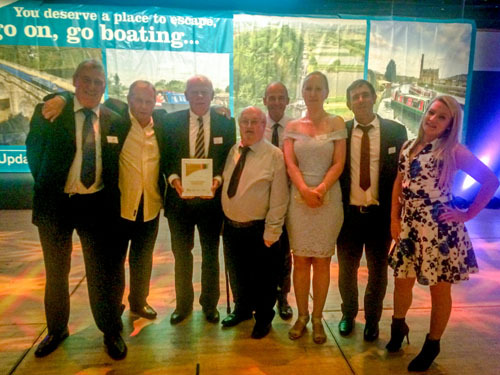 Recognition should also go the Shire Cruisers who loaned CNS a narrow boat to survey from Sowerby Bridge to Elland, as that stretch of the navigation was not accessable due to the collapse of Elland Bridge.